Gapsted Wines is the premium brand from the Victorian Alps Winery. Small parcels of fruit are hand selected and crafted into these meticulous wines of distinction. The range focuses on single varietals and innovative wines, including the Gapsted Ballerina Canopy series, Gapsted Limited Release and Gapsted Valley Selection. 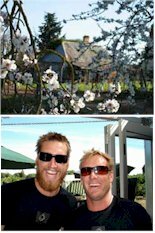 The Victorian Alps winery was established in 1997 by six great friends who were also wine professionals. 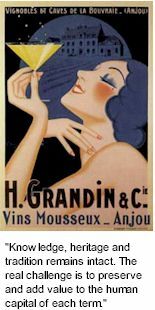 Their extensive experience in the industry and their passion for the region were central to the success of the winery over its relatively short existence. In 1999 the first wines were released under the Gapsted brand and in 2001 the stunning and award winning Cellar Door was opened. The vineyard produces a limited range of premium wines sourced from the property's old vines and as well as younger plantings. The Shiraz is sensational and the Sparkling Shiraz takes all of us back to those halcyon days of the Great Western Region. The Garden Gully's vignerons are still trying to reshape the grand old vines and repair some of the damage caused by several years of neglect. The strategy is to prune the vineyard as late as possible to minimize the frost risk. Despite the frost and the very small crop at Garden Gully, the vines need frequent watering to maintain vine health. Vines have been growing in Beaujolais since the second or third century, as attested by various writings. What is certain is that Beaujolas owes its name to the Sires of Beaujeu, who reigned over a large and important territory from the 9th to 11th centuries. In 1400, Edouard de Beaujeu gave his lands to the Bourbon. Pierre de Bourbon married Anne de France, Louis XI's daughter, who became known as Anne de Beaujeu and was the Regent of France. She bestowed her patronage on the town of Villefranche, and in 1514 Villefranche was designated the new capital of the Beaujolais. Great wine is made in the vineyard. At its best it is like a fingerprint, inextricably linking the personality and mood of the land from which it has sprung. After all, theirs was the southern-most vineyard in the world at that time and Canterbury was not then known as a wine-producing region. 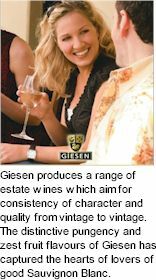 This was 1981 and the Giesens were, quite literally, breaking new ground for the fledgling New Zealand wine industry. Ignoring the scornful words of those who doubted Burnham's suitability for wine production, the brothers tended their plantings of Chardonnay, Riesling and Gewurztraminer and were rewarded in 1984 with their first vintage. 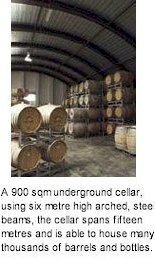 Glen Eldon Wines has vineyards located throughout the Barossa Floor and Eden Valley, each one selected for it’s micro-climate and distinctive flavour attributes for the final wine in mind. The main vineyard and cellar is located at the Glen Eldon property in Eden Valley, it was only fitting to honour this brand with the Glen Eldon name. 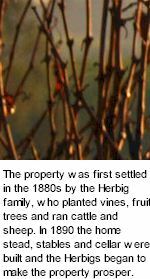 The property was first settled in the 1880s by the Herbig family, who planted vines, fruit trees and ran cattle and sheep. In 1890 the homestead, stables and cellar were built and the Herbig Family began to make the property prosper. Today Richard and Mary call Glen Eldon home. All the vineyard and winery operations are centralised from their headquarters at Glen Eldon. The Goldwater philosophy is simple - great wine is born in the vineyard. Goldwater combines old world traditional wine making techniques with modern day technology to achieve outstanding and memorable hand-crafted wines. 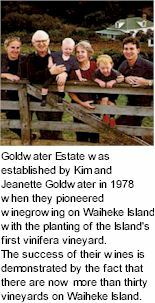 The success of Goldwater wines is demonstrated by the fact that there are now more than thirty vineyards on Waiheke Island. Careful site selection, sustainable viticultural practices and meticulous vineyard management, including innovative trellising and low yields, ensure the production of exceptionally high quality grapes. 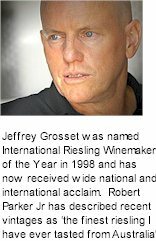 Led by Barry, Baz to those who know him, and Gabriela White, they shared a passion for both the production and consumption of wine. 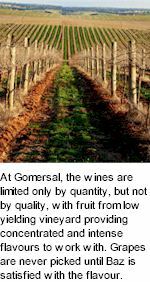 The winery, now known as Gomersal Wines, was resurrected with the establishment of a new vineyard in 2001, opening of a new cellar door in 2005 and function room in 2006, and of course, production of a range of quality wines. The vineyard, just across the road from cellar door, consisting of 42 acres of Shiraz, and 8 acres of Grenache and Mataro supplies the winery with rich quality fruit with which to make wine. The unique cellar door is a true Australian experience, with eucalyptus trees and native plants throughout the grounds, magnificent red gum tables and pink gum bar, and truly Australian artwork covering the walls. The Barrel Room provides a wonderful and versatile setting for functions of all styles, including weddings, birthdays, conferences, launches and art exhibitions. David and Rhonda acquired very early in life the horticultural skills that would later become invaluable when applied to the vineyards of Gracebrook. Both being from farming backgrounds, Rhonda's parents owned and operated a dairy farm here in the King Valley, across the road from what is now their home farm. During Rhonda's holidays and weekends she would work in the local vineyards, either handpicking fruit or pruning vines. David's parents also owned and ran dairy farms as well as growing beef cattle, pigs and later on growing tobacco on a small farm located at Edi. This is when David left school and started farming with his parents. 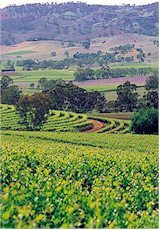 The Grampians Wine Region is one of the most significant, historical and acclaimed wine regions in the country. Vines were first planted at Bests and Seppelts in the mid 1860s and as they have prospered, others have joined them to produce wines of exceptional quality. The signature wines from the area revolve around the rich but delicate peppery shiraz wines, however white varieties such as riesling and chardonnay also suit the climate. And then there’s sparkling wines and the famous sparkling shiraz. 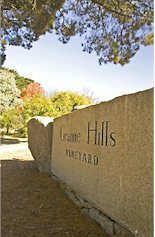 Granite Hills lies at the northern extremity of the Macedon Ranges wine region on Burke & Wills Track – the route taken by those famous explorers on their fateful journey north to the Gulf. The Knight family pioneered winemaking in the Macedon Ranges region - and since planting Granite Hills in 1970, have amassed in excess of 400 awards at Australian and international wine shows making Granite Hills wines the region’s most acclaimed. 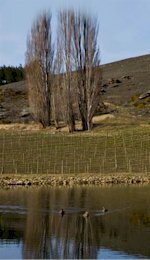 In establishing the vineyard, the proprietors searched for land that would provide the best conditions for consistently producing a premium Pinot Noir in a elegant Central Otago style. The chosen site is situated on Earnscleugh Road, across the Clutha River from Alexandra. The property enjoys high sunshine hours and high mean temperatures and is sufficiently harsh and difficult to make the vines work their hardest. With extremes of heat and cold comes the risk of spring and autumn frosts, providing a demanding but rewarding environment for the production of premium pinot noir. Gravitas wines are sourced entirely from estate vineyards in Marlborough. Apart from wine, the family business is also developing other luxury gourmet products, including black perigord truffles and ultra-premium olive oils. Marlborough's Wairau Valley is a spectacularly beautiful part of New Zealand, Land of the Lord of the Rings. An hour or so from the vineyards can be found the snow-capped St Arnaud's Mountain Range and ski-fields, the world-renowned Kaikoura whale and dolphin sanctuaries, deep limestone caves, the primordial forests of the Nelson Lakes National Park and the endless and empty white sand beaches of the Able Tasman National Park. 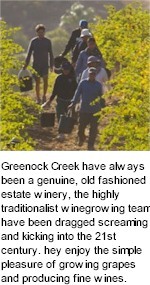 Greenock Creek have always been a genuine estate winery, the highly traditionalist winegrowing team have been dragged screaming and kicking into the 21st century. People who are familiar with them, know that they enjoy the simple pleasure of growing grapes and producing fine wines. They consider themselves to be stubbborn old dogs who still believe in a lot of core values, basic principles like trust and honesty, integrity and hard work, laughter, family and friends. The estate was launched in 1988 with two wines, 1986 Creek Block Shiraz and 1988 Chardonnay. Life was simple back then, it meant working long days which were physically tiring, but immensely rewarding. Tight cash flow, curculio beetles and salvation jane were all part and parcel of accepting life on the land. Alberto Antonini and David Gleave have known each other since meeting in Montalcino in 1989. Both make their living from Italian wine - Alberto as a winemaker, consultant and grapegrower, David as the UK importer of some of Italy's top producers - yet they have often discussed over the years the great allure of Australia and Australian wine. The styles of wine, and the freedom to plant and develop whatever variety you believe is going to work in your piece of land, is of great appeal to them both. So when Mark Walpole took Alberto Antonini, whom he knew through their shared interest in Italian grape varieties in Australia, to visit the Greenstone site, Alberto wasted no time in ringing David in London. Alberto was struck by the quality of the soil and site. “I’m standing on a hill in Heathcote that would make a great vineyard,” he said to David. That was all it took to set the Greenstone Vineyard in motion. Marlborough is well worth a visit not only famous for its famous wines, but also its picturesque coastline of the Marlborough Sounds, featuring many sheltered bays and harbours. Greenstone Point Winery started in 1997 as a joint venture company, Greenstone Point now has its own vineyard in Marlborough and produces wine from the company owned vineyards as well as selected Marlborough growers. Currently Greenstone Point produces around 15,000 cases per annum. Since these first plantings Gunn Estate has grown into a highly regarded producer of quality New Zealand wines including Sauvignon Blanc, Chardonnay, Riesling and Bordeaux varietals including Merlot, Cabernet Sauvignon and Malbec. The textured symbol on the Gunn Estate logo represents the Greywacke river gravel and waters of the Ngaruroro river that follow near the estate vineyards, it also symbolises the ‘O’ of Ohiti Valley - home of the Gunn Estate family. ‘From the Heart, from the Home’, captures the essence and philosophy of the Gunn family who have tilled and nurtured the estate vineyards since the mid 1980’s.